"You'll take Chai!!". Beatrice makes me laugh. Everyday. Without fail. She is the youngest member of the group at 22 and the one who always makes the Chai (mixture of milk, tea and sugar) and the meal each day. I asked her if she liked doing that or if it was just because she was the youngest and she shrugged and said 'I make the best Chai..' then of course laughs. She moved to Nairobi right before the election and ended up losing everything. Her house burned down with all of her possessions in it. 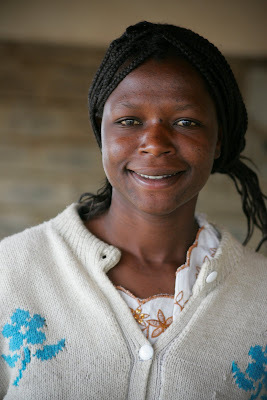 Beatrice, 20 then, had to start from scratch to start up a home again for herself and the 5 others she is responsible for. That's how she met Florence, one of the leaders of the WEMA group. Flo gave her water, clothes, and a place to sleep and there Beatrice found solace with the women in the WEMA group. She laughs and interrupts her own story and says 'Take me to America, I want to meet Obama'. We laugh together. I try to explain that i don't have a direct line to the President but she won't hear of it. We laugh again then her eyes get huge and she says "You'll take Chai!! ".